It’s been a while since the last recipe post! Part of the delay came from working on building an interactive tool over on the Vitamix Comparison page, which is now complete. If you feel like checking it out, I’d appreciate any feedback. 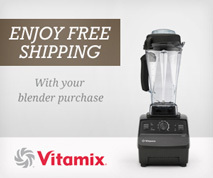 And if you know anyone who is deciding which Vitamix to buy, I hope it can help them out. 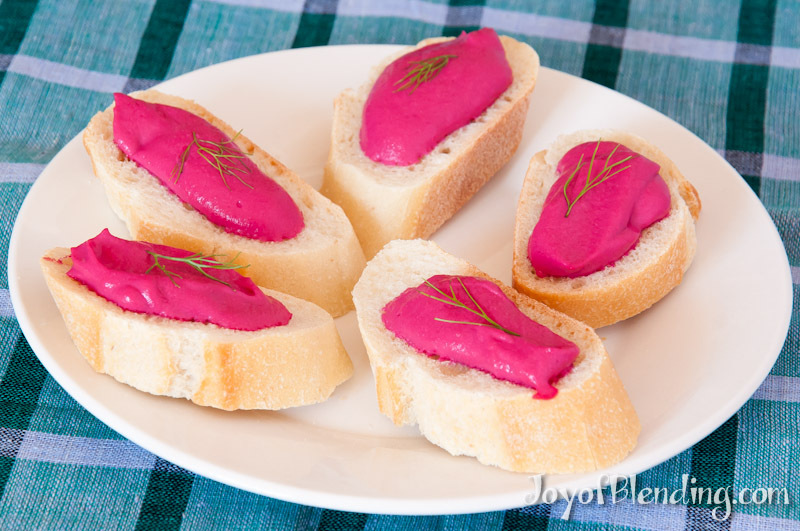 This zesty spread/dip is a modified version of a recipe from Vitamix chef Bev Shaffer. I first sampled her version on a visit to Vitamix headquarters. I was making it at home and accidentally misplaced the jalepeño that her version calls for, so I substituted ginger instead, and it was delicious. For the smoothest results, slice the ginger into ⅛” slices perpendicular to the length of the root. Blend on high until smooth (~45 seconds), using tamper to push ingredients into the blades. If you want a thinner consistency, you can add a little water or bean-cooking liquid. This is great as a spread on bread, as well as a dip for raw vegetable sticks. I usually cook beets using Mark Bittman’s aluminum foil method: scrub, wrap in foil, cook in oven at 400°F for 45–90 minutes (until tender), then pop them out of their skins once they’ve cooled a bit. For the medium-sized beet in this recipe, cooking time was about 60 minutes. If you want to try Bev Shaffer’s version, just add a deseeded jalepeño instead of the ginger. She also uses ¼ cup of white vinegar instead of the 2 Tbsp of apple cider vinegar. Alternatively, it’s hard to go wrong with the traditional hummus recipe. If you steam the beetroot, it will be much quicker, and the least times you use Alfoil (aluminium foil) when cooking, the better for your Health. Regular exposure to Aluminium – pots, pans and foil – is a leading cause of Alzheimers, simply not worth the risk. Beetroot is really nice steamed (in a steamer)so much so, I often include one with veggies. Also, you can cut a beetroot in cubes and place with beet-leaves in a steamer (the leaves are edible and tasty) add a little lemon and olive oil – it makes a really nice hot or cold salad! I like the sound of this Recipe!! !